Decades ago, a rumpled state rep from Brookline would go from event to event, largely Democratic political gatherings and journalist venues, and tout the concept of a North-South Rail Link, connecting North and South Stations and hence the entire northeast corridor from Maine to Virginia. He was dismissed as a crank. People would say yeah, it sounds great, but we’ve got the big bucks and big disruption of the Big Dig. The link is just not feasible. In more recent years, the unlikely combination of two former governors, one Democrat and one Republican, teamed up to push the idea. Mike Dukakis and Bill Weld advanced the concept, bringing it to the general public through radio and TV outlets. Now sixth district Congressman Seth Moulton is joining the cause. He outlined the case on Wednesday to the New England Council. Is it possible that the idea of the North-South Rail Link is no longer outside the realm of possibility. Moulton doesn’t come to such an undertaking as a neophyte. Prior to running for office, he had been involved in planning a Dallas-Fort Worth high speed rail link. He has visited even more complex systems in London and Zurich. There are 35 cross-city rail projects around the world. The alternative “stub and terminal” approach to expanding South Station (currently favored by Governor Charlie Baker) is, says Moulton, a very 19th century approach, requiring significant land acquisition and forfeiting potential development opportunities in the process. The North South Rail Link (NSRL) would be able to handle many more trains than the expanded South Station. The NSRL would be 2.8 miles end to end, have two tracks and three underground stations, all at a depth comparable to the Red Line at Porter Square. This would be well below the Central Artery. Unlike the Big Dig, Moulton says the rail link between Boston’s North and South Stations could be built with little surface disruption. The advocates’ vision for this is big and exciting, a 21th century infrastructure investment that connects people with jobs and housing. According to a cited 2015 Harvard study, the NSRL would take 55,000 cars off the road and significantly reduce commute times. The state has agreed to invest $2 million in a study of the link’s feasibility while Moulton continues to build his coalition of local, state and congressional supporters. He insists that adequate federal money to build would be available for the Northeast Corridor and makes the case that people from Maine to Virginia would benefit, along with Massachusetts cities and towns well outside Boston. Obviously this is a big – really big – ticket item. 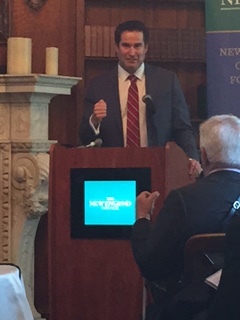 Moulton told reporters the cost would be about $2 billion. We all know what often happens to original estimates. But the London crossrail project, due to open in 2018, is the largest in Europe, far more extensive than what is contemplated here. And, says Moulton, it is on time and on budget. Critics infer from Boston’s rejection of the Olympics that we can no longer think big and move boldly. Making the North-South Rail Link a reality would be a lot more meaningful that running a one-off Olympics event and would help keep Boston competitive with cities the world over. Years ago, MIT’s macro-engineering visionary Frank Davidson (a leader in the creation of the Chunnel train) pushed for consideration of a supersonic train from Liverpool to Boston, or at least one from Boston to New York via Long Island Sound. The North-South Rail Link is a much more modest undertaking and should be carefully scrutinized. This is one area where we really could demonstrate our ability to think big and get it done. This entry was posted in Politics, Uncategorized and tagged Big Dig construction, Central Artery, Congressman Seth Moulton, connecting the Northeast Corridor, Governor Bill Weld, Governor Mike Dukakis, North South Rail Link, The New England Council. Bookmark the permalink. Definitely worth consideration, although advocates rarely mention where the intermediate stations would likely be. I imagine that construction of the stations is where a very large chunk of the costs will be. This should be done because it makes sense, not for consideration as a “world class” city. Certainly there are a number of cities where trains run from one suburb straight through the city to another suburb and this would ease congestion on the subway lines as well as allowing competent staff on the MBTA greater flexibility and efficiency in scheduling. Hurrah for Moulton and this rail link!